PALATKA, Fla. - A 10-year-old elementary school student with autism spelling "apricot" correctly Friday to be named the Putnam County Spelling Bee champion Friday. Middleton-Burney fifth-grader Armand Kuykendall was one of 15 students who competed in the spelling bee at the Putnam County Commissioners' Board Room. "We were bawling. We just, we had our hands in our laps and we were just crying," said Rebecca Horn, Armand's mother. "He's got a community that supports him." Horn said her son has dealt with many obstacles in his young life, including autism and ADHD. She and her husband adopted Armand when he was 3 years old; he was previously abandoned, malnourished and abused. Despite his challenges, Armand is a straight-A student and attends speech therapy classes regularly, Horn said. 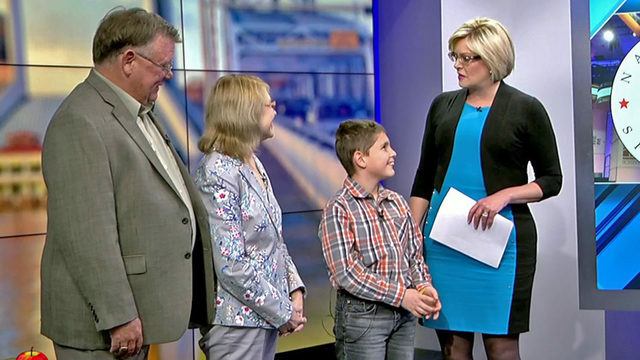 Appearing Tuesday on News4Jax' The Morning Show, Armand& and his parents talked about how they worked with him to overcome any challenge that was in his way. "When we first got Armand and he came out of his situation, we were told by the doctors that we were raising a 3-year-old child because of his inability to speak, to communicate," Rebecca Horn said. "It was a lot to overcome." "Starting off, verbal communication as a challenge for him. He gets occupational therapy and speech therapy, but when you think about it, it's just amazing, where he has come from and to be able win the spelling bee, I can't say how proud we are," father Kim Horn said. "There are no words to explain." Speaking of words, Armand studied 450 words before Friday's spelling bee and will study even more before the regional spelling bee next month. Armand moves on to complete in the 75th Annual First Coast Spelling Bee on Feb. 19 at Jacksonville University. This regional spelling bee will be broadcast on WJXT-Channel 4 and livestream on News4Jax.com.